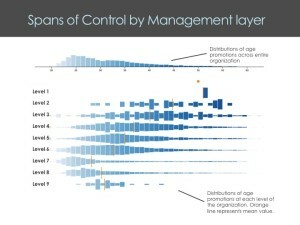 One challenge that most CHROs face, especially those from large and rapidly growing organizations, is managing spans of control and management layers. Spans and layers differ from one organization to another, and from one division to another, but the principles essentially remain the same for effective communication and efficient processes. Before we delve further into how spans and layers add to the complexity of workforce design, let’s first brush up the definition of both. The spans of control is the number of employees a manager can control at any given point in time. Layers are the maximum number of reporting levels from top to bottom. Now, the wider the spans of control, the flatter the organization is. But it also indicates that managers spend more time on managing their people and perhaps, less on achieving organizational goals. Whereas narrower the spans of control and taller the organization (more layers) result in filtered communication and delayed decision – making. There is no magic number for the optimal spans of control. It could be 8×8, 10×10 or 4×6, as long as it can enable the organization to become leaner, agile and innovative. If CHROs can achieve the good spans and layer in their organizations, they can ensure better organizational productivity, elimination of silo mentality, efficient utilization of resources and higher cost savings. However, as the organization employs more people as it expands or grows, the spans and layers get added further. It may disrupt the optimal balance of the organizational workforce design. From a workforce planning and design perspective, spans and layer analysis should be a routine exercise. And, this can be done only if there are tools to simplify this analysis. According to the Global Human Capital Trends 2015 report, simplification of work environments and practices in response to information overload and increasing the complexity of an organization as well as the system are an emerging theme. HR leaders require implementing ‘design thinking,’ a process that brings user interface designers, process experts and graphics people together to make work systems more functional and easier to use. Workforce Analytics is one such ‘design thinking’ process, which can perform an in – depth and real time hierarchy based calculations, no matter how complex or data – centric they are. Here is how. It can immediately spot the concentrations and patterns of large spans of control. It can highlight those who fall outside this metric and require attention. It can identify people who hold official titles (such as project or program manager) but aren’t the managers. It can gauge every manager’s performance and determine that only the deserving ones are promoted. It helps to bridge the communication gap between the management levels, thereby ensuring that the top management knows what’s happening on the ‘ground’ level. 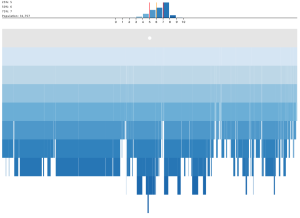 Visual workforce analytics tools from Macromicro can help CHROs analyze the spans and layers in their organization and make optimal adjustments.